As major measles outbreaks in New York, Washington and Oregon continue to spread, you may be wondering just how strong our defenses against vaccine-preventable diseases are. Vaccinate Your Family (VYF) has once again summarized the state of vaccine-preventable diseases in the U.S. in our 2019 State of the ImmUnion report. Coinciding with the President’s annual State of the Union address, this report examines the reasons why children, adolescents, adults, and pregnant women may not be receiving timely vaccinations. Most importantly, the report recommends several policy solutions to stop the needless loss of lives due to vaccine-preventable diseases. 2018 proved that vaccine-preventable deaths are still a threat to the U.S. and that it is everyone’s responsibility help protect people of all ages, as well as our communities. 18,400 children did not receive vaccines, putting them at serious risk of disease or even death. A measles outbreak in Minnesota cost the state $1.3M, an amount that does not include the costs sustained by private insurance or the indirect costs incurred by families due to lost days of work or ongoing care. 31,200 of 33,700 cases of HPV-related cancers could be prevented each year. Flu, pneumococcal disease, shingles and whooping cough cost $27B to treat each year in adults 50 years and older. 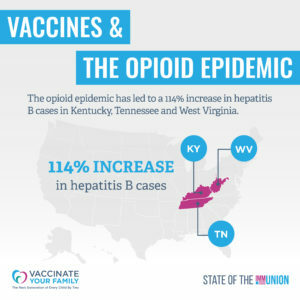 The opioid epidemic has led to a 114% increase in hepatitis B cases in Kentucky, Tennessee and West Virginia with similar increases expected across the country. 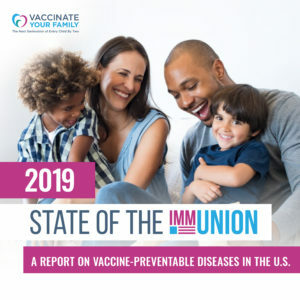 Please read the 2019 State of the ImmUnion report for more on how vaccines and vaccine-preventable diseases can impact you, your family and your community. Have questions about vaccines? Learn more about how vaccines work, and why they are the right choice for protecting our every member of your family and communities. 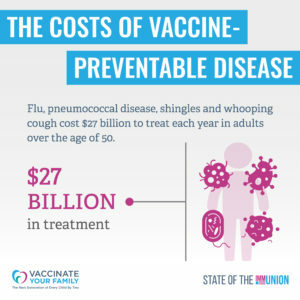 And please ask your Members of Congress to increase federal funding to the Centers for Disease Control and Prevention (CDC) so that our country can continue to build our defenses against vaccine-preventable diseases at the national, state and local levels. Vaccinate Your Family: The Next Generation of Every Child By Two is a leading source of science-based vaccine information. You can find information on common questions about vaccines, vaccine safety oversight, disease outbreaks and other topics on our website and social media pages. Learn more at Vaccinateyourfamily.org. And on social on Facebook, Twitter and Instagram.